San Diego home, beach resort home in Southern California. You are only steps away from the Beach and Ocean. This is the best value for an ocean view house so close to the beach. You will be staying on the ocean side of the court in beautiful Mission Beach, San Diego, California. The house sleeps 9 ( total number of beds) to 22 ( if you put 2 in a bed ) as a 5 BR, 3 BA. The bonus is the home has a lot of outside space. There are 3 outside decks.The Ocean level deck has a natural gas grill great for barbecues. There is also a private deck with a Jacuzzi in the back of the house and an Ocean view deck on the roof. Included are 2 small parking spaces in the garage, which also has room for storage. The house is equipped with all that you could possibly need for a vacation home with high quality comforters, linens and towels. Fully furnished with modern furniture and new super comfy beds. There are 5 LCD HDTVs with premium channels and turbo speed Wireless Internet, and an Xbox 360 with plenty of games and DVD movies. The main kitchen is very large and includes all the cooking utensils and appliances that you may need. There is a second kitchen in the room that is part of the house upstairs perfect for entertaining. The property has a full size washer and 2 dryers in the garage. Recently remodeled granite Kitchen Counters and cabinets. Beautiful new wood flooring and Saltillo tile throughout the home. This is the quintessential big beach house in Mission Beach. 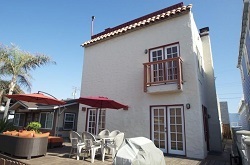 SoCal Vacation Home Rental in San Diego CA..